My Camino de Santiago: How much sacrifice should you make for the camino? How much sacrifice should you make for the camino? Is taking a bus or other transportation for some section of the camino be considered as less than a pilgrimage? What about staying at a hotel or a hostal instead of an albergue for some nights? Sometimes when the albergue is full, there may be no choice but to pay more for a hostal/hotel/pension. Less communal, more privacy. What about assistances in transporting one's backpack? 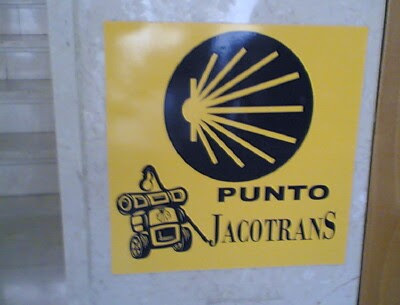 Some towns/cities along the camino has transport service for your backpack. For a few euros, you can leave your backpack with them in the morning and pick it up at your next stop later in the day. I like this picture. A backpack on wheels with a pilgrim staff, drinking gourd and the Santiago clam shell. Sometimes a bit of assistance is necessary to complete one's journey. On the other hand, there are many pilgrims who started their walk close to Santiago (minimum 100 km to get your compostela) carrying virtually nothing and probably had booked their hotel for each night in advance. Then there are tour groups that have tourist walking just a few kilometers a day and the rest of the distance in the tour bus. What about pilgrims that walked the first day or two, takes a bus/train to avoid the mesatas, another day or two, and finally the last 100 km to get their compostela? A German pilgrim said "I can recommend many beautiful walking path in Europe, but please don't use the camino for that. It is for a different purpose". Other pilgrims considered that as cheating, saying that they rather remain as a 'purist'. I am curious, what is a 'purist'? A medieval style pilgrim? I'll bet that if a medieval pilgrim were to do his camino now, he would be taking a train all the way to Santiago. As for me, I walked all the way from Roncesvalles to Santiago. No buses or any public transport under any situation. 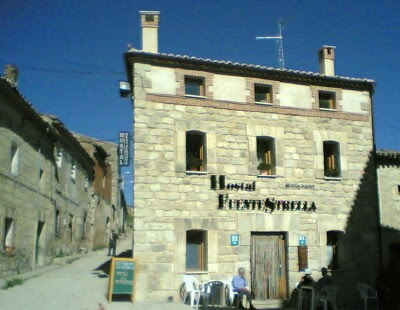 However, I did stay at a pension in Burgos and at the end in Santiago. In short, I believe that the definition of a pilgrim is not in your feet, but in your mind. Just do your own thing.